While the unemployment rate has improved significantly in recent years, the official unemployment rate only includes those who have looked for a job in the last four weeks. It does not include those of working-age who dropped out of the labor force entirely — neither working nor looking for work. (Figures do not include those in prison.) The labor force participation rate has not returned to pre-2007 recession levels, and relative to 2000 the rate looks even worse. Things are particularly bad for those without a college education, the core of Donald Trump’s support. The overall unemployment rate obscures the low labor force participation rate, especially among those without a college education. The labor force participation rate of natives without a college degree shows little meaningful improvement in the last four years. For example, in the third quarter of 2012 it was actually slightly better than it was in the third quarter of 2016. 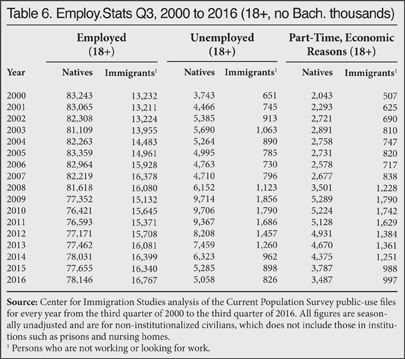 In the third quarter of 2016, 70.4 percent of natives without a bachelor’s degree were in the labor force, compared to 84.7 percent with a bachelor’s degree — a 14.2 percentage-point difference. In the third quarter of 2007, the gap was 11.1 percentage points, and in the third quarter of 2000 the gap was 10.6 percentage points. The two primary employment surveys collected by the U.S. government are referred to as the “household survey” (also called the Current Population Survey or CPS) and the “establishment survey” (also called the Current Employment Statistics Survey or CES). The establishment survey asks employers about the number of workers they have. In contrast, the CPS asks people at their place of residence if they are working. Both surveys are collected by the Census Bureau for the Bureau of Labor Statistics (BLS). While the two surveys show the same general trends, the figures from the two surveys differ to some extent. The data for the tables in this report comes from the public-use files of the July, August, and September CPSs for 2000 to 2016. The tables presented here are reported by quarter. Quarterly data are more statistically robust, especially for smaller populations like immigrants and minorities, due to the inclusion of three months of data. Persons in institutions like prisons or nursing homes are not included in the CPS. The CPS is the nation’s primary source for unemployment and other labor force statistics. Like all government surveys, the data are weighted to reflect the actual size and demographic makeup of the U.S. population. The Unemployed. The standard measure of unemployment, referred to as U-3, takes the number of people who report that they are not working and have looked for a job in the last four weeks and divides it by the number actually working plus those looking for work. 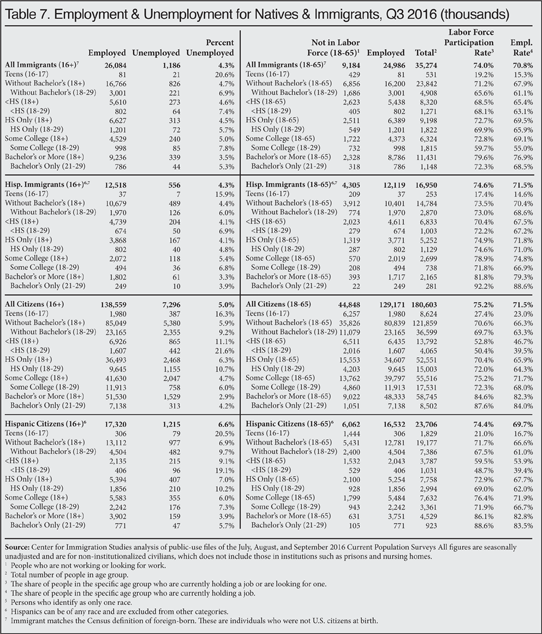 The top halves of Tables 1, 3, and 5 report the number employed and the number unemployed for the third quarter of each year, 2000 to 2016. 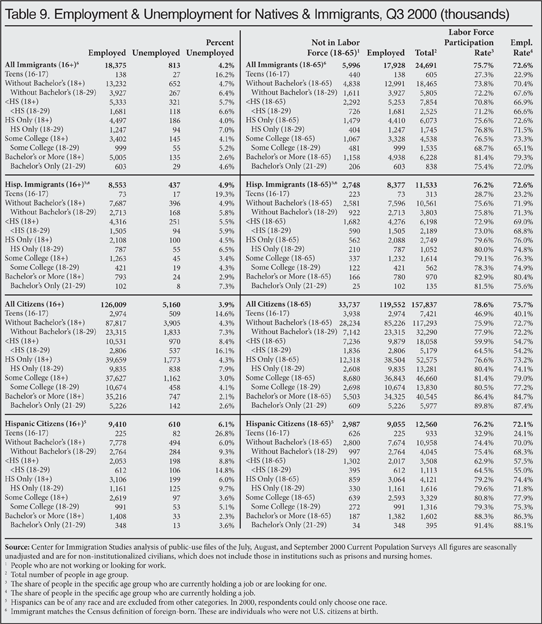 The left sides of Tables 7, 8, and 9 also report the U-3 unemployment rate in detail for different segments of the population in 2000, 2007, and 2016. We focus on 2007 and 2000 because they represent the peak years of the last two economic expansions. The Labor Force. The labor force includes all those working or who have looked for work in the four weeks prior to the CPS. When looking at the number and share not in the labor force, it is very common to report statistics only for those under age 65 because the overwhelming majority of those over 65 do not work for reasons not related to economic conditions. 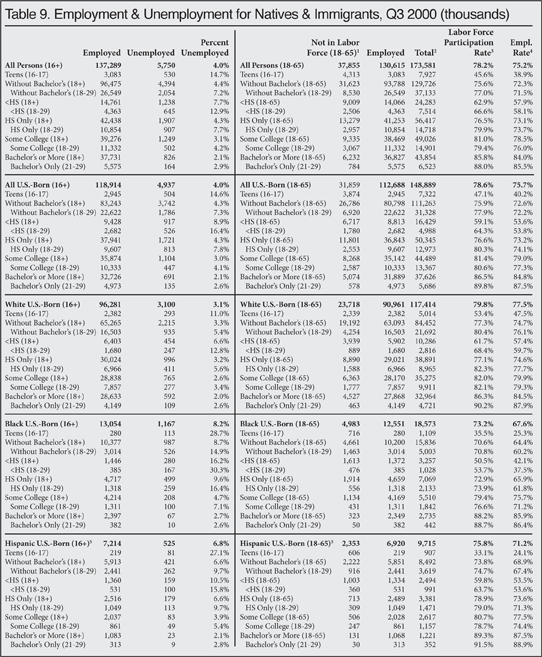 The right sides of Tables 7, 8, and 9 report the number working in detail for different segments of the population in the third quarters of 2000, 2007, and 2016. The tables also report the share of people in the labor force, which is the inverse of those not in the labor force, as shown in Tables 1, 3, and 5. The right sides of Tables 7, 8, and 9 also report the employment rate. The employment rate is simply the share of people in each segment of the population who are working.